It's Halloween and you may be scrambling at the last minute to find a costume for a Halloween party this weekend. Fear not dear readers, Wabi-Sabi is here to help with five unique ideas that I posted a couple of years ago. They are guaranteed to make an impression (although not necessarily a good one) at your party. Take a fabric pen and draw a large "P" on the front of a shirt (or cut a "P" out of paper and pin it to the shirt) then put black make-up around one eye. Voila! You are a "Black-Eyed Pea". Take a Frankenstein mask (or some bolts and green make-up) and attach a wild Einstein-style wig. Spray the wig with green hair paint. Wear a lab coat with pens and a pocket protector. Ta da! You are "Frank-Einstein". Wear all black and attach a large white number "8" to your shirt. When asked what your costume is, say "Reply hazy, try again" and ask them to shake you. After all, you are a "Magic 8 Ball". For a couple, he wears a giant "E". She wears paper clips. Presto chango! You're an "e-male and attachment". Wear a bra on the outside of your shirt. Attach a letter "Z" to the bra. Suddenly, you're a "Z-bra". Dress as Superman, Charlie Brown or other recognizable cartoon character. Attach long strings to the front of your costume with safety pins. Tie little army men to the end of each string. Walk slowly while leaning forward, and when people ask what you are say, a "Macy's Thanksgiving Day Parade Balloon!" P.S. 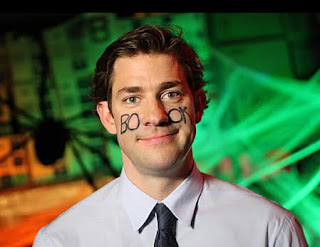 I loved Jim's "Facebook" costume last night on the Office. Very creative and cool. Think we will be doing the E and paperclip idea when we go to the Ultimate Frisbee Competition. Thank you.